Your tax-deductible donation today assures great Bridge journalism throughout 2018. Bridge is the Michigan answer to a national news crisis. Many daily newspapers across Michigan and the nation are dying. Newsroom employment has dropped 60 percent or more since 2000. In contrast, Bridge Magazine’s fact- and data-driven, online-only news publication is growing rapidly. More than a million readers a year depend on Bridge for in-depth coverage of education, the economy, politics, and other important Michigan issues. Bridge has doubled the amount of published content in 2018. 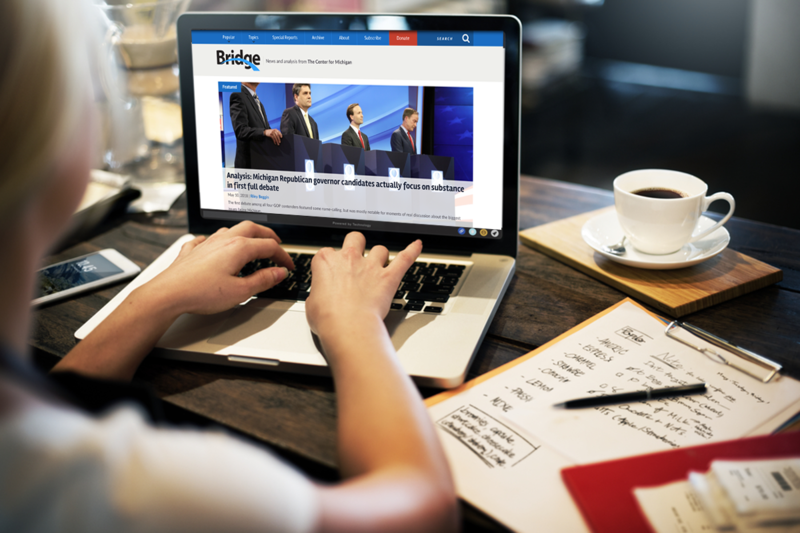 Launched in 2011 by the nonpartisan Center for Michigan, Bridge now employs nine veteran professional journalists who bring you Michigan’s in-depth news almost every day – online, via email, and on social media. Last month, Bridge earned 23 reporting awards from the Society of Professional Journalists. This month, Bridge earned its third straight Michigan Press Association “Newspaper of the Year” honor. Reader donations make all the difference. Our customers – you, the readers – told us in large numbers you wanted deeper and more frequent watchdog coverage of the state capitol and Michigan’s environment. We’ve added three reporters in 2018 to bring you consistent, nonpartisan, thoughtful coverage of those beats. Bridge continues to grow because reader donations continue to grow. Don’t settle for less. Please help us bring you more! It takes less than 60 seconds to contribute $25, $50, $100, or a monthly amount to grow and sustain Bridge Magazine’s high-quality, credible news in this age of fake news and traditional newspaper decline. Who’s going to tell you? Who’s going to watchdog politicians and government? Who’s going to explain how schools perform? Who’s going to explain how your tax dollars are spent? Who’s going to inform you about the Michigan economy? Increasingly, the enormous burden of thoughtful, nonpartisan news gathering in Michigan falls on Bridge. With your help, Bridge can meet that burden. *Special thanks to the Herbert H. and Grace A. Dow Foundation, Community Foundation for Southeastern Michigan, Wege Foundation, and Glassen Memorial Fund for matching spring reader donations!